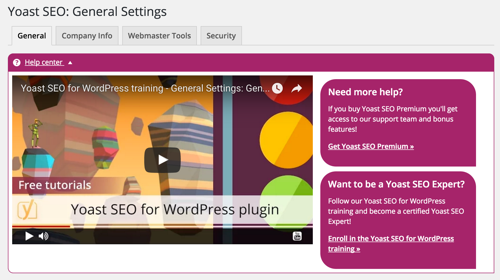 Today we’ve pushed out Yoast SEO 3.2. This release’s most notable feature is the addition of a help center to every settings page. You’ll remember we released tutorial videos a while back. These videos are now available right where you’d need them: on the tab that each video discusses. Other changes include accessibility improvements and tons of bug fixes. Last but not least, we have Social Previews in Yoast SEO Premium. 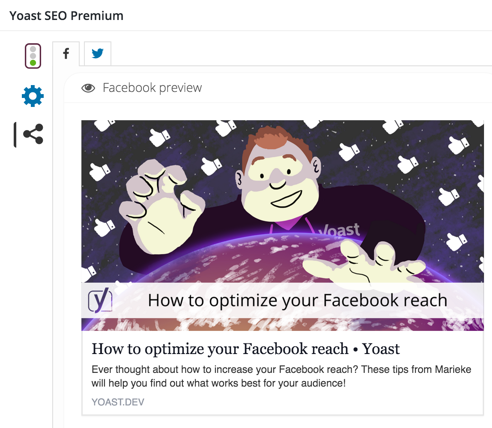 In Yoast SEO Premium, we added a cool new social previews feature. Much like the snippet preview it shows you what your post will look like when shared on Facebook and Twitter. If you don’t have premium yet, now might be a good time to get it! We’ve removed the “hide” features we had, for hiding RSS feeds and a few other things. There simply is no real SEO benefit to these features. On top of that WordPress is adding more and different things to the <head> all the time and deleting them can lead to issues. Google+ is dwindling, so we were already discussing its fate in our plugin. The Google+ metadata on posts was conflicting more and more with Facebook. Facebook was picking up Google+ images over Facebook OpenGraph images. These factors combined made us decide to remove the Google+ functionality from the plugin. We’ve made a ton more changes under the hood this release. XML sitemaps received a lot of care, as well as the content analysis. We added some new features you might want to use in your theme with the yoast_get_primary_term() and yoast_get_primary_term_id() functions. Eleven contributors outside of Yoast contributed to this release with patches. This brings the total number of contributors to the plugin to 112, a number we’re very proud of! Go try it, and let us know in the comments what you think!